Financial KPI (Key Performance Indicator) is a measurable value that indicates how well a company is doing regarding generating revenue and profits. Monitoring KPIs shows whether a business is achieving its long-term goals. Regardless of the size, age, and industry, each and every company needs to be conscious of their financial performance. While accountants deal with all the expenses, income and budgets, the company’s leadership also needs to be informed about important financial measures. The fastest and most efficient way to keep track of an organization’s business performance is to set up a KPI dashboard that displays financial metrics. The perfect financial KPI report presents real-time updates on a company’s important financial figures, such as the Operating Cash Flow, the Current Ratio, Burn Rate, etc. 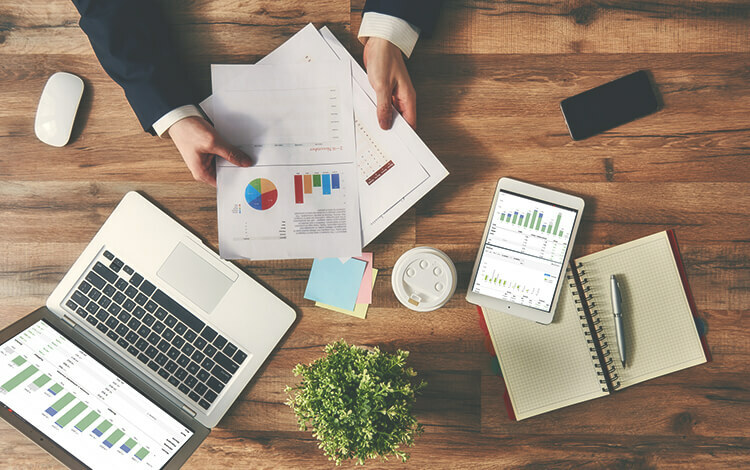 Starting with the most widely used financial metrics, we’ll move through the full spectrum of important budget metrics that most companies should measure. If you’re new to the world of performance tracking and dashboards, see the example of creating a perfect business KPI dashboard in Scoro. Here’s another resource for you: See a list of the best articles on different types of KPIs and learn more about KPI dashboards. OCF shows the total amount of money generated by a company’s daily business operations. The financial metric hints whether a company can maintain a positive cash flow needed for growth or requires external financing to cope with all the expenses. Operating cash flow is calculated by adjusting net income for things like depreciation, changes in inventory and changes to accounts receivable. While analyzing your OFC, compare it to the total capital employed to evaluate whether your business produces enough capital to keep the accounts positive. Current Ratio reflects on an organization’s ability to pay all the financial obligations in one year. This financial KPI takes into account a company’s current assets such as account receivables, and current liabilities, such as account payables. How to evaluate your Current Ratio: A Current Ratio of less than one indicates that your company will not be able to fulfil all financial obligations unless there’s an additional cash flow. A healthy Current Ratio is between 1.5 and 3, but it’s not infrequent for businesses to have periods of Current Ratio under 1, especially if the company is investing in growth or accumulating debt. Investors like to use the Current Ratio as an indicator of whether a company has a healthy operating cycle. A too high CR may indicate that the company has a lot of assets and cash, but fails to invest in innovation and growth. Want to see KPIs in action? See how to create a perfect business dashboard in Scoro. The acid-test ratio indicates whether a business has sufficient short-term assets to cover its near-future liabilities. The Quick Ratio gives a more accurate overview of a company’s financial health than the Current Ratio as it ignores liquid assets such as inventories. This financial KPI reflects the rate at which a company is spending money on a weekly, monthly or annual basis. This basic metric can benefit small firms that do not undertake the extensive financial analysis. Compared with Net Profit Margin and Revenue, the Burn Rate indicates whether the organization’s operating costs are sustainable in the long term. This metric shows how efficient is a company at generating profit compared to its revenue. Frequently calculated as a percentage, this KPI indicates how much of each dollar earned by the company translates into profits. The Net Profit Margin reflects on the profitability of a business and shows how fast the company can grow in the long-term prospect. The Gross Profit Margin measures the proportion of money left over from revenue after accounting for the cost of goods sold. This metric is a great indicator of a company’s financial health, indicating whether a business is capable of paying its operating expenses while having funds left for growth. Usually, organisations have a relatively stable Gross Profit Margin figure, unless they’ve done some drastic changes affecting the production costs or undergone a change in the pricing policies. The Working Capital KPI measures an organisation’s currently available assets to meet short-term financial obligations. Working Capital includes assets such as available cash, short-term investments, and accounts receivable, demonstrating the liquidity of the business (the ability to generate cash quickly). Immediately available cash is known as Working Capital. Analyse financial health by reading available assets that meet short-term financial liabilities. Working capital, calculated by subtracting current liabilities from current assets, includes assets such as on-hand cash, short-term investments, and accounts receivable. Working Capital is calculated by subtracting current liabilities (financial obligations) from current assets (resources with cash value). This financial KPI measures the amount of money owed to a business by its debtors. The Current Accounts Receivable metric helps to estimate the upcoming income and calculate the average debtor days, showing how long it takes for an average business partner or client to pay back their debt. Curious to find out more? Read a thorough explanation on what is a KPI. Opposite to the receivables, the Current Accounts Payable metric indicates the sum that a business owes to suppliers, banks, and creditors. It can be broken down by business departments, divisions, and projects, to have a more detailed overview of current payables. To calculate the Current Accounts Payable, organisations need to take into account all liabilities that need to be paid in a particular time frame. This financial KPI indicates the rate that an organization pays its average payable amount to suppliers, banks, and other creditors. Here’s how to calculate the Accounts Payable Turnover: Let’s say a company makes $10 million value of purchases from suppliers in a month and at any given point has the remaining Accounts Payable of $2 million. This means that the Accounts Payable Turnover is $10 million / $2 million = 5. If the turnover ratio is falling compared to previous periods, it might indicate that an organization is having troubles paying back its debt. If the turnover rate increases, it means that a company is paying back its suppliers at a faster rate than before. The Accounts Payable Process Cost indicates the total cost of processing all payments and invoices in a particular period. A look at the results of APQC’s survey on accounts payable (AP) process productivity suggests that there is a strong case to be made for investing in electronic invoice presentment, processing, and payment (EIPP) technologies as they significantly lower the cost of processing invoices and paying to suppliers. The Accounts Receivable Turnover shows a firm’s effectiveness in collecting debts and extending credits. If a company maintains a large opened bill for a customer, it’s like giving away an interest-free loan, instead of using the money to grow the business. To calculate the Accounts Receivable Turnover, companies need to divide the net value of credit sales during a given period by the average accounts receivable during the same period. The calculation is very similar to figuring out the Accounts Payable Turnover: net value of credit sales/accounts receivable. The lower this financial metric, the less a business struggles with collecting debts and payments, having more assets ready for investing in growth and innovation. The Inventory Turnover KPI indicates how efficiently a company sells and replaces its inventory during a particular period of time. So it reflects an organization’s ability to generate sales and quickly re-stock. Budget Variance is also a frequently used project management KPI, indicating how projected budgets vary compared to actual budget totals. The metric is used to evaluate whether the budgeted or baseline amount of expenses or revenue meet the expectations. A minimal budget variance indicates that the actual expenses are equal or lower than the projected ones, or the revenue is higher than anticipated. A significant variation in budgets is usually caused by too optimistic forecasting or poor leadership decisions. The Budget Creation Cycle Time indicates the period used to research, plan and agree on a company’s budget. A long budget creation cycle isn’t necessarily a bad thing, but it might use up valuable resources like the leadership’s time. The line items in a budget help managers and project leaders to keep track of expenditures in a more detailed way. The line items can signify projects, business departments, or some other accounting measures, to give a better overview of where the money is spent. Moreover, a detailed budget makes it easier for a company to address the right departments and projects when in need of cutting the budgets. The higher the number of budget iterations, the more time it takes to plan a budget and get it right. The number of budget versions produced before the final approval depends on the leadership’s ability to plan efficiently the next term’s budget. According to a survey, the top 25% participants had the average of 4 budget iterations, while bottom performers are used to 9 budget versions before the final approval. This financial metric shows how many team members are engaged in payroll processing compared to the total number of employees. The Payroll Headcount Ratio indicates the number of employees in an organization that is supported per one dedicated full- time employee. To calculate the Payroll Headcount Ratio, businesses need to find the ratio of HR full-time positions to the total number of employees. This financial metric displays the change in total sales generated over a certain period. The Sales Growth shows the percentage of the current sales period compared to the previous one, indicating growth or decrease in total sales. The DSO metric displays the average number of days required for clients to pay a company – from receiving the invoice until the full payment. The lower the DSO is, the more a company can focus on growing and ordering additional supplies. This financial KPI shows the current payments a company is due to vendors (Anyone who provides goods or services to an organization or individuals). High vendor expenses might indicate that the business is having troubles paying to its vendors and suppliers on time. The Payment Error Rate displays the percentage of incoming or outgoing payments that were not completed due to a processing error. Frequently, the reason for failures is a lack of approval, poor documentation or a missing reference. If a company’s Payment Error Rate increases over time, it may indicate that it’s time to review the payment processing system. The Internal Audit Cycle Time shows the average period required to perform a full internal audit. This number considers mainly a company’s leadership and stakeholders that need an overview of the budgets, expenses, payments, etc. This financial metric displays the number of financial reports that require further clarifications or contain errors, necessitating a review and a more detailed investigation. This KPI indicated the capacity of a business to use shareholder’s investments efficiently, generating high profits. The Return on Equity shows how much revenue a company generates for each unit of shareholder equity. Similarly to the Return on Equity metric, this KPI shows how effectively a business is using their shareholder investments. A high Debt to Equity Ratio indicates that an organization is losing investments and accumulating debt instead of generating new profits out of investments. This financial KPI can be tracked by business departments, to measure the cost of managing people’s work and planning for the future. The lower the cost of managing processes, the more assets are left for implementing tasks and growing the company. For some companies, the employee’s time is the most valuable asset that they also bill the customers for. This is true for creative agencies, law firms, and other service-based business models. The resource utilization KPI indicates how effectively a company uses its resources (time), comparing the billable time vs. non-billable work. It can also be used on a project dashboard for a better overview of project performance. The Total Cost of the Finance Function displays the ratio of the total cost of financial activities compared to the total revenue. An organization’s financial costs include personnel, managing systems, overhead, and any other expenses necessary for the day-to-day operation of the finance organization. According to an APQC benchmarking survey, the best-performing companies have the average Total Cost of the Finance Function of 0.6% while the bottom 25% has the average Total Cost of 2.0%. Enterprises that want to improve this metric need to embrace modern technology and software to automate and optimise their business processes. Now that you’re familiar with the concept of all important financial KPIs, it’s time to set up a financial KPI dashboard to track and measure your company’s financial performance. If you’re new to the world of the business dashboard, here’s a helpful resource for getting started and creating your first KPI tracking dashboard: The Complete Guide to KPI Dashboards.